This property now consists of two separate little shop units. The building was divided into two shops about 1880, but before that time it was one single unit. Unfortunately we don’t any good photo which show the two shops. The photo on the left shows Thompson Cafe in the right hand unit. The one below on the right shows Francis Gayner in the right hand unit. On 15th January 1647 the said tenement then in the occupation of Christopher Cam, schoomaster was conveyed to the feoffees. The property continued to be held by the Feoffees until 1880 when they sold it to Henry Gayner for £700. It was described as a messuage or tenement comprising a dwelling house and two shops situate in the High Street and now in the occupation of Henry Gayner at an annual rent of £17 per annum. The Feoffees also sold the old Grammar School and house in Castle Street and Atwells School in St Mary street. They wanted the money to buy land in Gloucester Road on which they built the new Grammar School. In the 1670 Rent Roll it shows that the property (then described as being half a burgage) was occupied by Robert Ayler. Samuel Thurston – the account books appear to indicate that Samuel was paying rent from about 1746 to 1755. We know from an indenture relating to a property Samuel owned at 28 Castle Street that he was a joiner. The Feoffee Accounts books show Samuel regularly did work for the Feoffees for which he was paid. Presumably this involved Samuel in carrying out repairs to properties owned by the Feoffees. Samuel was baptised at Oldbury on 3rd March 1725. He was the son of John Thurston and his wife, Ursula. Samuel married Mary Lewis from North Stowey and they had at least four children. The Scribes Alcove website details the baptism of three of them: Sarah baptised in Thornbury on 17th August 1752, Molly baptised there on 13th June 1761 when she was about 2 years old , Horatio, born on 6th May 1757 and baptised in Thornbury on 29th April 1766. On Horatio’s baptism record it notes that Samuel was a joiner and Horatio was their fourth child. Another Thurston source on the Internet mentions another son, Samuel born in 1662. Samuel died aged 79 and was buried at Thornbury on 6th June 1804. Thomas Trayherne (orTrayhurn) – the Feoffees Accounts show that Thomas was paying rent on the property from 1798 onwards. He may have been there earlier but there is long gap in the account records we have seen. The rent on the property was £3 per annum. Based on his age at his death, Thomas would have been born about 1765. It is likely therefore that he is the Thomas Trayherne born on 5th June 1765 and baptised on 14th October 1765. He was the fourth child born to William Trayherne, a tailor and his wife, Hester. The baptism records show that Thomas was a tailor, like his father. J. Niblett – the 1809 Rent Roll indicates that ‘J. Niblett’ was sharing the property with Thomas Trayherne. We don’t know enough from this entry to be certain of his identity. He could have been John Niblett the glazier who died in 1816 aged 55 but as we know that he was living in 54 High Street and later moved to 21 St John Street, it is more likely to be his or his son, John Niblett. This John was born in 1790 and he became a plumber and glazier. On 22nd March 1812 John married Mary Stinchcombe in Thornbury. Their daughter, Mary Ann was baptised on 22nd October 1817. Local and national newspapers in August 1825 reported a court case between William Alway and John Niblett, a plumber and glazier, in which William was claiming compensation from John as damages for what was referred to as ‘a criminal conversation’ involving William’s wife and John Niblett. The court awarded William £120 in compensation. The case details mentioned that William and Patience had separated, that William had give up his work and ‘become a wanderer from his home’. Sarah Barnett – a document written in 1826 listing the property belonging to the Feoffees shows Sarah Barnett was paying £6 10s rent per annum for a house and stables. The 1830 Rent Roll indicates that Sarah was now sharing 19 High Street with Thomas Trayherne. The 1840 Tithe Survey confirms that Sarah was sharing Plot 190 with Thomas ‘Traherne’. Sarah’s part of the property was described as a ‘house and stable’. Henry and Sarah continued living here through the 1850s, 60s and 70s and Henry ran a drapers shop there. In 1875 the Feoffees undertook some major alterations and repairs at Henry Gayner’s house. We suspect this may have involved dividing the building into two units. In July 1880 the Feoffees put the property up for sale as they wanted money to buy land in Gloucester Road on which they built the new Grammar School. The High Street property was described as a messuage or tenement comprising a dwelling house and two shops situate in the High Street and now in the occupation of Henry Gayner at an annual rent of £17 per annum. The Feoffees also sold the old Grammar School and house in Castle Street and Atwells School in St Mary Street. 19 High Street was sold to Henry Gayner for £700. Henry died on 26th August 1881 aged 60. Sarah died on 30th March 1885 aged 68. It was left to their son, Francis to carry on the family business. Henry Liddiatt – the 1890 Rate Book shows Henry Liddiatt had taken over as tenant of one of the shops owned by Frances Gayner. 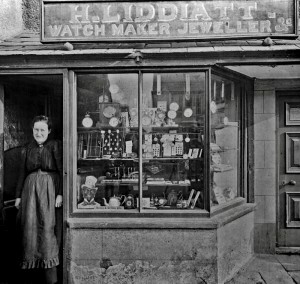 He carried on using the shop until about 1910. 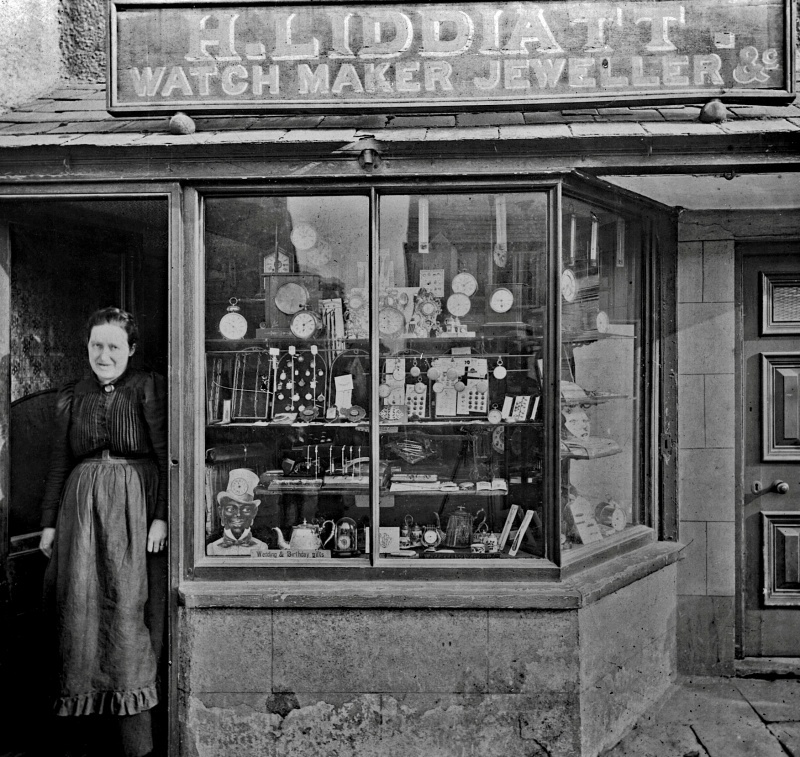 Click on the thumbnail photo on the right to see a larger image of the clock shop run by the Liddiatts. Thompsons Bottom Shop – the 1925 Valuation List and 1926 Rate Book show the property had been taken over by Albert Edward Thompson. Albert had opened a the bakery at their main shop at 67 High Street. The shop next to the Swan became known as ‘The Bottom Shop’ and the one at 67 High Street as ‘The Top Shop’. The bottom shop was a cafe and a refreshment rooms selling confectionary and teas. We understand it was run by Albert’s daughter, Betty Thompson. In the register compiled in 1939 in preparation for the war Ronald Glenthorne Bull and his wife, Isabel Nora (nee Mahagan) were listed as living in the property, presumably in the rooms above the cafe. They were married in Thornbury in 1936 and they had a daughter, Joyce K. born in 1937. They were still there in the 1946 electoral register. By 1950 they had moved to 25 North Road. In 1959 the Thompsons sold their businesses to Christofer Bell. They didn’t keep the Top Shop for very long, but they carried on using 23 High Street, at least the right hand part of the property, as a baker’s shop. By 1964 the bakers shop had closed and both shops were lying vacant when there was a major fire. Both properties were destroyed and had to be re-built. The new shops were occupied by Brooks the Cleaners in the left hand unit and John James selling electrical goods in the right hand unit. Click on the thumbnails below to see larger photos of the buildings before the fire, the damaged buildings and the new ones which replaced them. Since that time the left and unit has had a lot of different occupants including the Evening Post. The right hand unit has been used as a travel agents, initially by Lunn Poly and since by Thomsons.